[New York, NY/ Washington, DC] A lawsuit over a provision in the National Defense Authorization Act (NDAA) was back in a federal appeals court at 10am on February 6, 2013, awaiting decision on an injunction prohibiting indefinite detention of civilians without charge or trial. Today news broke that the Supreme Court would not grant a seperate application by the plaintiffs to vacate the stay on Judge Katherine Forrest’s injunction baring the use of indefinite detention under § 1021(b)(2) of the NDAA. You can read the supreme court transcript HERE (#12A600). A group of academics, journalists, and activists filed the successful suit last fall over § 1021(b)(2) of the NDAA alleging that the provision suspended due process rights and threatened first amendment protections. On September 15, 2012 the plaintiffs were awarded a permanent injunction by Judge Katherine Forrest of the Southern District of New York. Their victory is being appealed by the Obama administration. Both sides, as well as lawyers for Senators McCain, Ayotte, and Graham, presented oral arguments to the 2nd Circuit Court of Appeals during the February 6th proceeding. The first point is that Judge Forrest’s ruling was not only historic in that she stood up to the same administration that appointed her, but also because it underscored the fact that these plaintiffs each had standing in the case. This means that it was Judge Forrest’s interpretation that each plaintiff, could be at risk for indefinite detention under § 1021(b)(2) of the NDAA, for their otherwise constitutionally protected work as journalists or activists. The second point was revealed in the 24 hours after Judge Forrest issued her permanent injunction on September 15th, 2012, when the Obama Administration filed a request for an “emergency stay” of her ruling. While, an appeal of the ruling was expected from the Obama Administration, no one could have expected the speed and ferocity in which they would file their request, especially with only a little over a month until election day. This led many to suppose that this administration has either inherited detainees who were imprisoned indefinitely using powers similar to those outlined in § 1021(b)(2) or are regularly using these powers themselves, and thus would be in contempt of court if Judge Forrest’s ruling stood. This supposition is the most frightening part of the narrative surrounding § 1021(b)(2) as it infers that, for quite some time, American authorities were using detention powers that they never had, and only now are attempting to create a retroactive mandate that would make legal their previously illegal detentions. This revelation (if properly articulated) may be the integral component to finally forcing the mainstream media to cover this complicated and previously politically taboo issue. On February 4th the White Papers detailing the United States’ targeted killing policies were leaked to Michael Isikoff at NBC News subsequently forcing many of the mainstream outlets to question the bloat of executive powers post 9/11. This provided a unique opportunity to insert talking points into this discourse about similar misuse of executive and military powers under § 1021(b)(2) of the NDAA. The “Flood the Court” event called for by activists on February 6th could not be ignored as it drew hundreds of people to the Second Circuit in protest of § 1021. Similarly it saw a dozens of media outlets in attendance beyond that of the alternative outlets and citizen journalists who have tirelessly dedicated themselves to this story. All of the press generated from the event was positive and in favor of the plaintiff’s arguments, including some major and mainstream hits in The New York Times, The Guardian, Reuters, and The New York Law Journal. You can read a semi-complete roundup of the laundry list of related media coverage HERE. In the battle against the NDAA there are three fights, one is the lawyers fight in the courtroom, the other is a battle of public perception to the issue, and the third is a battle in the streets to salvage what little of our democracy is left in hopes that one day we may be able to restore it. We here at Sparrow have been working around-the-clock to get these courageous plaintiffs the press coverage they deserve. We hope that we can create a public outcry so deafening the Supreme Court will be forced to rule in favor of the plaintiffs and favorably on the issue of indefinite detention. Tagged Chris Hedges, daniel ellsberg, hedges v obama, Jacob Appelbaum, national defense authorization act, NDAA. Pentagon papers whistleblower Daniel Ellsberg, Pulitzer prize-winning journalist Chris Hedges, attorney for CIA Whistleblower John Kiriakou, Jesslyn Radack, filmmaker Michael Moore, RevolutionTruth Executive Director and NDAA Case Coordinator Tangerine Bolen and journalist Alexa O’Brien, each supporters or plaintiffs in the Hedges v. Obama lawsuit challenging the controversial indefinite detention provision set forth in § 1021(b)(2) of the National Defense Authorization Act (NDAA), will address the U.S. government’s assault on civil liberties under the NDAA in a discussion at 5pm this Wednesday, February 6th at The Culture Project, 45 Bleecker St, NYC. Seeking to create mainstream dialog about this landmark court battle the NDAA plaintiffs and supporters will present this once-in-a-lifetime panel discussion moderated by Matt Sledge of The Huffington Post and people’s champ Natasha Lennard of Salon.com. Attendees will be offered an up-close look at this transformative year-long court battle and what is driving the Obama administration as they continue to appeal Judge Katherine Forrest’s historic September 15th, 2012 ruling in favor of the plaintiffs. On Wednesday morning at 10am the plaintiffs are due back in Federal Appeals Court to present oral arguments against the suspension of constitutional protections under the indefinite detention provision. They will be challenged by President Barack Obama’s lawyers who will advocate for the provision, and in a bizarre twist, will also be challenged by Senators John McCain, Lindsay Graham and Kelly Ayotte who collectively have been granted a 5-minute oral argument by the 2nd Circuit Court of Appeals. This panel will serve in-part as a debrief to the media and public of what transpired in the 2nd Circuit earlier that morning. Themes will include the profound erosion of liberties cemented by the 2012 NDAA, a pattern of abuse and intimidation on the part of the Obama DOJ toward publishers, whistleblowers and activists, and the creative efforts of the widely disparate groups that have joined the lawsuit team and its supporters from around the world. 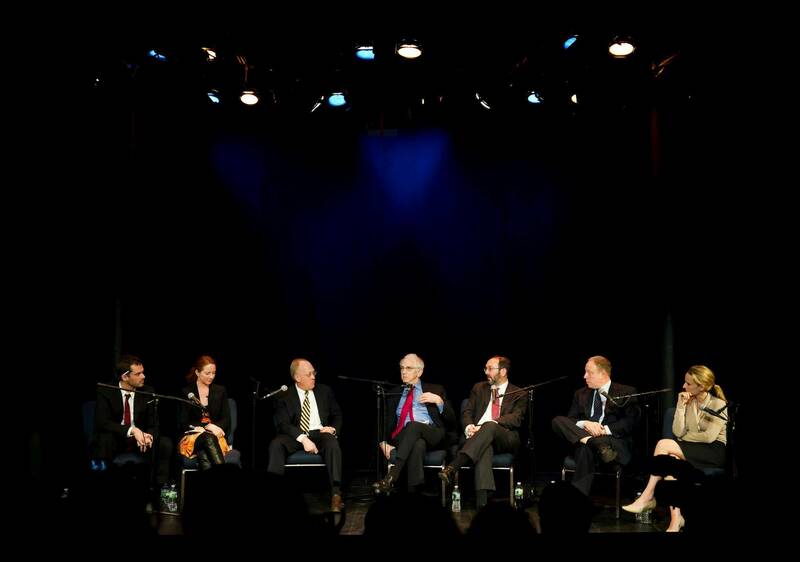 WHAT: Panel discussion w/ Michael Moore, Chris Hedges, Tangerine Bolen, Daniel Ellsberg, Alexa O’Brien, Jesslyn Raddack, Thomas Drake, Matt Sledge, and Natasha Lennard. MEDIA RSVP: All media who wish to attend please send an RSVP to Andy Stepanian at andy@sparrowmedia.net as space will fill up fast. To arrange an interview with any of the panelists please email or text Andy Stepanian at andy@sparrowmedia.net or 631.291.3010. Tagged Chris Hedges, daniel ellsberg, hedges v obama, jesslyn radack, john kiriakou, michael moore, NDAA. 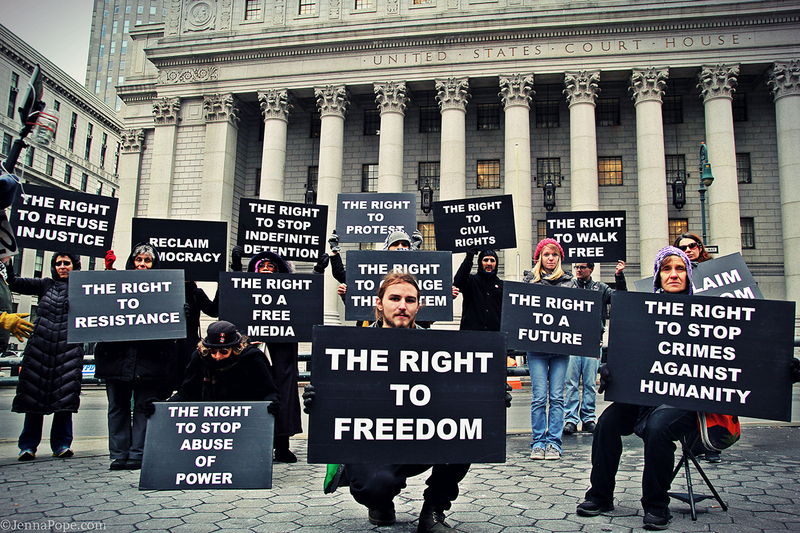 [New York, NY] A lawsuit over a provision in the National Defense Authorization Act (NDAA) will be back in federal court at 10am on February 6, 2013, awaiting decision on an injunction prohibiting indefinite detention of civilians without charge or trial. A group of academics, journalists, and activists filed suit last year over § 1021(b)(2) of the NDAA alleging that the provision suspended due process rights and threatened first amendment protections. Despite including a signing statement expressing deep reservations over the “indefinite detention provision” and promising not to use such powers against American citizens, President Obama immediately appealed Judge Forrest’s ruling, and sought an emergency stay on the injunction, claiming “irreparable harm” would be incurred by the US if the government lacked the ability to indefinitely detain civilians under section 1021. In opposition to the plaintiffs Senators John McCain, Lindsey Graham and Kelly Ayotte have utilized the Amicus process to file a brief in support of the government’s use of § 1021(b)(2) of the NDAA and have taken the unusual step of filing a motion requesting 10 minutes of oral argument time in the February 6th, 2012 proceedings, claiming the need for the Senate body to be represented in court when it comes to indefinite detention. Plaintiff attorneys are awaiting word on whether the 2nd Circuit will grant this motion. UPDATE: On Thursday, January 31st, 2012 attorneys for the plaintiffs received notice that McCain, Graham and Ayotte were awarded a 5 minute oral argument at the proceeding. To compensate for this the 2nd circuit also added 5 minutes onto the plaintiff argument (allowing for 20 minutes total). Plaintiff and lawsuit coordinator Tangerine Bolen will lead a press conference upon adjournment of the court session. Speakers will include Tangerine Bolen, Daniel Ellsberg, Chris Hedges, Bruce Afran, Alexa O’Brien, Cornel West, Thomas Drake, Jesselyn Radack and a number of others working to prevent indefinite detention and restore civil liberties. To obtain video of the press conference or to arrange an interview with any of the plaintiffs or counsel please contact Andy Stepanian at andy@sparrowmedia.net or 631.291.3010. 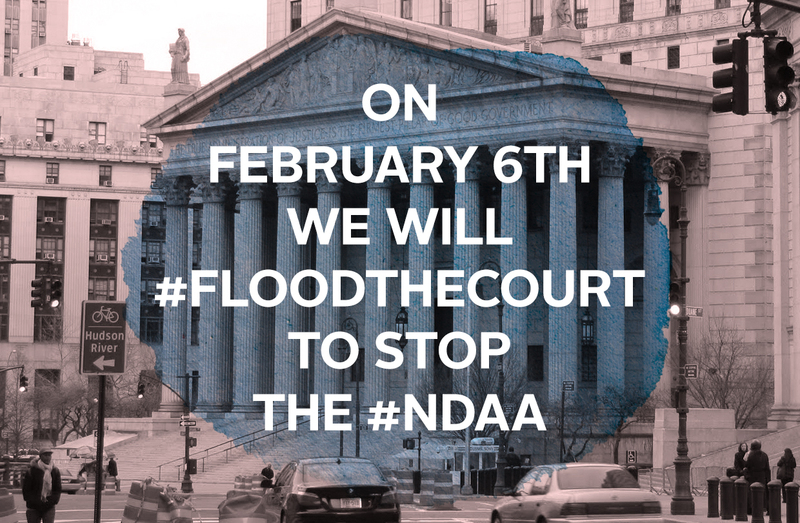 Tagged #floodthecourt, barack obama, Chris Hedges, daniel ellsberg, hedges v obama, korematsu, lawsuit, NDAA. [New York, NY] On November 29th, 2012, activists, journalists and attorneys gathered for a press conference outside of New York’s Federal Courthouse in support of jailed activist Jeremy Hammond. In a November 20th, 2012 hearing U.S. District Judge Loretta Preska denied bail to the 27-year-old Chicago activist accused of hacking into the private intelligence firm Stratfor and releasing information to Wikileaks, and notified him that, if convicted, he could face 37 years-to-life in prison (transcript). At the November 29th press conference, John Knefel, a journalist and cohost of Radio Dispatch highlighted Preska’s distinct conflict of interest and went on to reveal to the press in attendance that Preska, herself, was in fact formerly an associate at Cahill Gordon & Reindel LLP. While Preska’s personal information was not unearthed by the hack or released by Wikileaks, this prior professional association with government-named victims in the Hammond case underscores her inability to preside over the Hammond case in the impartial manner awarded to him by the constitution. Activists are calling on Preska to recuse herself before formal motions are filed by Hammond’s attorneys on Monday, December 3, 2012. On Monday, attorneys for Hammond will file an official motion for Preska’s recusal as well as a motion for a new bail hearing. 2.) DONATE TO JEREMY’S LEGAL DEFENSE! 3.) DONATE A TWEET OR FACEBOOK POST! With this simple online tool you can donate one tweet (or Facebook post) a day to our efforts. The Sparrow Project will publish statements of support for Jeremy (like the ones below) from influential figures. Your donated posts will help us widen the audience that is exposed to this important story. Simply visit THIS LINK and click donate! The security and surveillance state is creating a hermetically closed system of power. It is doing this by rewriting laws to subvert the Constitution and grant itself the ability to criminalize all forms of dissent. The FISA Amendment Act, the Authorization to Use Military Force Act, the enhanced terrorism laws, the misuse of the Espionage Act to silence whistle blowers, and the National Defense Authorization Act, section 1021, which empowers the government to use the military to seize and detain U.S. citizens, strip citizens of due process and hold them in indefinite detention, are chilling examples of a new America, an America where liberty and freedom have become a hollow cliché. Nearly all of the government’s actions and decisions, many of which violate our most cherished civil liberties and defy the Constitutional call for a separation of powers, are now effectively hidden from the public. These decisions are beyond the scrutiny of the press or the judiciary. At the same time, we as citizens have no privacy left. The government has handed to itself the capacity to carry out the warrantless wiretapping, monitoring and eves dropping of tens of millions of citizens. Our personal data, correspondent, histories, employment records, private activities, phone logs, emails exchanges, travel and political views are stored in perpetuity in government supercomputers. We are the most monitored, spied on, photographed, listened to and watched population in human history. Our security and surveillance state now dwarfs the cruder forms of internal control of past totalitarian states, from Nazi Germany to the Stasi state in East Germany to Stalin’s Soviet Union. Anyone, including whistle blowers at the National Security Agency or the CIA, who attempts to bring to light government crimes, as we have seen with the Obama administration’s use of the Espionage Act six times to silence dissidents within the system, is hounded, persecuted and faces the possibility of long prison terms. Those who have the skills and capacity to electronically enter these closed systems of information terrify the state. They are treated not as criminals but as terrorists. They are denied fair trials. They are imprisoned in conditions that can only be described as torture. They are subject to murky statutes and laws that make a mockery of democracy and have no place in an open society. And the state, when it confronts those who have this capacity, uses everything at its disposal to destroy these opponents. We are not asking today for very much. We are asking for a fair hearing in a court of law. We are asking that Jeremy Hammond be permitted to present his case before a judge who does not have a personal involvement in his alleged activities, a personal involvement that will clearly prejudice the outcome. Hammond has enough stacked against him already. It at least deserves a chance at justice. It is a sad commentary on U.S. society that it is we, the dissidents, who call for the rule of law while the power elite and the organs of the state distort and subvert the rule of law. Our society has been turned upside down. We need to resist in every way possible this gross inversion of democracy not only for Hammond but, finally, for ourselves. The Wikileaks are telling in that, despite repeated assertions that it has no outstanding liability for Bhopal, the corporate giant Dow Chemical decided to hire the intelligence and surveillance company Stratfor to spy on and monitor Bhopal activists from 2004 to 2011. In fact, as late as March Dow CEO Andrew Liveris argued that ongoing outrage about Bhopal absolutely did not pose a threat to Dow. But If, as Dow holds, Bhopal is a nonissue and all grievances are settled, why did Dow enlist Stratfor to, e.g. gather information about the current and former staff of the ICJB, document the ICJB’s online activity, as well as that of the UK-based Bhopal Medical Appeal, and report events and programs held by the Yes Men? The global outcry over Dow’s sponsorship of the 2012 Summer Olympics and subsequent public relations fiasco confirmed that, on the contrary, the issue of Bhopal remains more important than ever. If anything the leaks show that however much Dow tries to downplay Bhopal in public, that behind closed doors it is very much concerned about it. Wikileaks released on February 27th reveal that Dow hired Stratfor, a private US company, to spy on and monitor activists who campaign for justice for the 1984 Bhopal, India gas disaster, from July 2004 to December 2011. They include emails between Dow and Stratfor that document, in the form of regular updates, the identities of current and former staff of the International Campaign for Justice in Bhopal, emails exchanged on the ICJB public listserv, and ICJB conference programs and schedules, as well as tweets, Facebook posts and press releases by the UK Bhopal Medical Appeal. Also recorded are dates and locations of speaking events and film screenings by the Yes Men, who in 2004 as part of a hoax impersonated Dow on TV and accepted responsibility for the disaster. Dow used Stratfor to monitor coverage of Bhopal in the news as well, both in India and abroad, in connection with the 2012 Summer Olympic Games in London, of which Dow is a sponsor, actions held around the anniversary of the disaster, such as last year’s “Rail Roko” action in Bhopal, and comparisons between Bhopal and the BP oil spill. Stratfor also monitored developments in ongoing court cases in India and in the US concerning Bhopal. Throughout Strafor meticulously recorded whether Dow’s relation to Bhopal was portrayed in a negative light or not in the media. Granted, the intelligence rounded up by Stratfor is not secret: it is all public knowledge, available, e.g., on the ICJB website and public listserv, and can be collected in the main by anyone with competence enough to use Facebook, RSS feeds and Google Reader. But for a company that vehemently denies responsibility for the disaster (which in 1984 killed tens of thousands, injured and afflicted with permanent illnesses many times more, and continues to, via the contamination of drinking water in around the disaster site) and argues that all past grievances are settled, Dow sure is concerned. Why contract Stratfor if Bhopal is a nonissue? Is it because, contra Dow, both US and Indian courts continue to debate Dow’s liability? That in 2011 the Indian supreme court produced a curative petition, in an effort to secure just compensation for the victims, more than the meager amount allotted to them in 1999? Is it because, against Dow’s hand-waving and nay-saying to the contrary, citizens the world over are outraged that Dow, responsible for not only Bhopal, but for dioxin poisoning in Midland, Michigan, the production of napalm in the Vietnam War, and the second greatest amount of toxic waste production in the US, is a sponsor of the 2012 Summer Olympics, allegedly the greenest yet? Is it because coverage of Bhopal in the news threatens Dow, against Andrew Liveris, who in a recent interview denied that it did? Or is it because, at bottom, Dow refuses to acknowledge responsibility for the worst industrial disaster in history, and is determined to evade justice for as long as it can? The ICJB welcomes Dow’s interest in Bhopal, however disingenuous. But rather than collect intelligence on activists, Dow should use its time, money and resources to instead carry out justice for Bhopal once and for all, to wit, acceptance of responsibility for the disaster, just compensation the victims, and clean-up of the disaster site. In the meanwhile the ICJB reiterates its commitment to Bhopal, and pledges to campaign for justice, in the face of Dow’s wiles and efforts to evade it. Cofounder of The Yes Men! 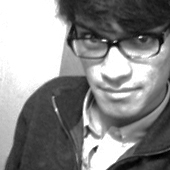 Whoever was responsible for the release of the Stratfor emails, i want to thank him or her from the bottom of my heart. Whoever released these emails performed a function that’s an integral part of democracy, as surely as voting or running for public office. Whether through civil disobedience or investigative reporting, which this is sort of in-between, exposing evildoing is, indeed, an integral part of democracy, that we utterly depend on. There are many ways to expose evildoing and fight against it. In Bhopal, a number of folks have been doing it for 28 years, ever since ever since a chemical plant in their city exploded in 1984, killing 3000 in one night and 20,000 more across the years. Their main target is the Dow Chemical company, the company ultimately responsible for the disaster. To try to hold Dow accountable, the activists there have gone on hunger strikes, marches from Bhopal to delhi, and so on. They’ve had a lot of success getting attention for it in India, and have recently gotten the Indian government to reopen long-closed investigations. Their real target, though, is Dow. And since Dow has no legal recourse against these activists, can’t stop them – they’ve spent large amounts of money to hire Stratfor to spy on their victims in Bhopal, to find out what moves their victims might make next. No one would have found out about this sick situation if there hadn’t been this leak of millions of emails, of which Jeremy is accused. Whoever did this leak exposed a lot of other corporate wrongdoing too – Stratfor was also spying on Occupy, PETA, Wikileaks, Anonymous… oh, and the Yes Men. Yes, us. They were spying on us because in 2004, we joined the Bhopal activists in trying to shame Dow into providing redress for the 1984 disaster. We set up a fake Dow website and got ourselves invited by the BBC to speak on the 20th anniversary of the disaster as Dow. We announced to the world that we, Dow, were going to compensate the victims, clean up the site, and basically do everything that Dow should. The world loved the announcement – but the market punished Dow by cutting billions off its stock value. There was an enormous amount of press, and millions of people found out about Dow’s responsibility for the world’s biggest industrial disaster. Publicly, Dow said nothing. Privately, they paid Stratfor lots of money to spy on us. That’s very sinister – but it’s also very flattering. 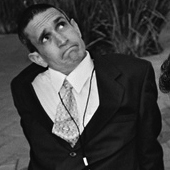 It means that Dow and other companies see us – and the Bhopal victims, and Occupy – as a threat. A threat that can actually change things. Which it can – maybe not with each action, but cumulatively. Thanks to the activists in Bhopal, and the Occupy movement, and the millions of activists who are fighting in their own ways to bring evildoers to their knees… slowly but surely, inexorably, all these people are bringing democracy to America, just as it’s always happened. That’s kind of what we Yes Men learned when we connected with the Occupy movement, who Stratfor also spied on, and discovered that all the activism, that sometimes seems pointless, actually does have a great effect: the Occupy movement, for example, itself the product of so much activism before it, profoundly shaped the presidential election, and continues to have even profounder effects. Tagged #freehammond, anonymous, Chris Hedges, jeremy hammond, loretta preska, lulzsec, stratfor, wikileaks. [NEW YORK, NY] The debate surrounding “diversity of tactics” has indeed become a polarizing one …perhaps we helped (in part) to change that last week as we attempted to bring the fervor of both sides to the CUNY Grad Center for a respectful debate surrounding tactical legitimacy in today’s contemporary social movements. 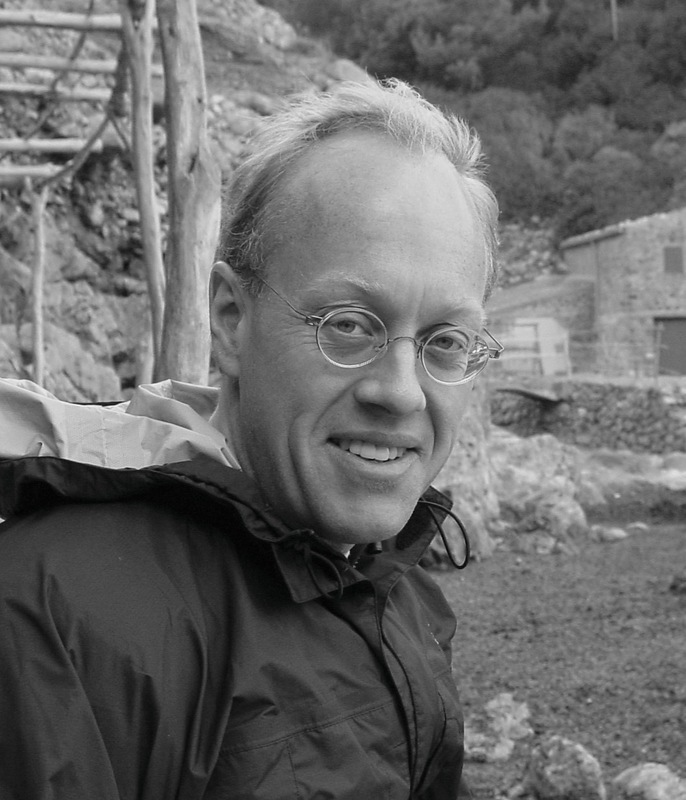 Chris Hedges made himself a self-described “lightning rod” for this tactical debate in February, 2012 when he published his now infamous “The Cancer in Occupy” article (an indictment of black-bloc tactics) on his syndicated TruthDig column. The sometimes ugly debate that followed Hedges’ article continued to boil over on internet forums and comments feeds surrounding the Occupy movement. Since there is little accountability on internet forums and similar venues we thought it would be prudent to bring both sides together for a respectful face-to-face debate. Short of a handful of passionate outbursts the audience at last week’s debate at the CUNY Grad Center between the Pulitzer Prize winning journalist Chris Hedges and B. Travern of The Crimethinc. Ex-Workers Collective was perhaps the most disciplined “real-world” assembly surrounding this polarizing argument.Both Travern and Hedges attempted during the debate to define where tactical legitimacy begins and ends. While each had differing answers to the moderator’s questions, the audience was excited to see the intersections between the two. Travern conceded that he found himself agreeing with ~80% of what Hedges said about revolution. Interestingly Hedges also conceded when he proclaimed that “he is not a pacifist” and announced during the debate that he too is an advocate for “a diversity of tactics” …yet the two drift apart when defining what “diversity of tactics” personally means to each of them. Though some awkward gaffs were made, and some questions left unanswered, the event as a whole was an informative and encouraging experience that many could take a great deal away from. We encourage you to watch the video above, share it with your friends, embed it on your own blogs, continue to build dialogue surrounding the issues therein, and most of all take action for a more just future in the most effective and sensible ways you see fit. This event would not have been possible without the help of the CUNY Grad Center, Sujatha Fernandes, Sarah Leonard, Mintwood Media, Jen Angel of Aid & Abet, and the volunteers that helped with everything from filming to de-escalation.. Tagged b travern, black bloc, Chris Hedges, crimethinc, debate, occupy, ows, tactics, the cancer in occupy, video.